In the workplace Marching Order organizes the placement of interior furnishings, such as desks and file cabinets. 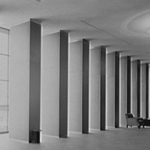 Found prevalently in open plan offices, Marching Order spatially subdivides a vast open area. 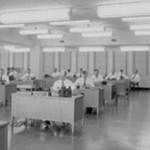 Through the uniform and stationary orientation of individual desks and file cabinets, as well as the placement of computers, chairs, and task lamps, a Marching Order creates modules that are offset from each other by a uniform distance,1 emphasizing the regularity of the arrangement and communicating strong messages of how one should circulate throughout and interact within the space. 1) Leah Scolere, "Theory Studies: Contemporary Retail Design" (MA Thesis, Cornell University, 2004), 59. 2) Franklin Becker, The Successful Office (Boston: Addison-Wesley Publishing Company, 1982), 24.